Would you rather speak to somebody on the phone? Call +31(0)10-436 21 33! Lasergame Rotterdam is suitable from 6 years. The Splashtours & Lasergame Arrangement is perfect for water enthusiasts. You will kick off at Lasergame Rotterdam and will go down in a submarine. The Splashtours & Lasergame Arrangement is perfect for water enthusiasts. You will kick off at Lasergame Rotterdam and will go down in a submarine. After a short explanation you will play two lasergame sessions with a short break in between. At the end of the game you will enjoy more action in the Splashtours amphibian bus. Splashtours is the most remarkable and unforgettable way to discover Rotterdam. 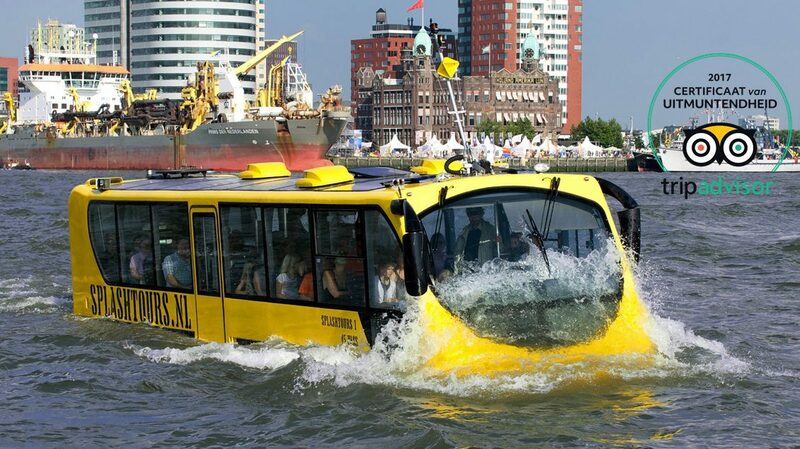 After a city tour the bus will ‘splash’ into the Maas, next to the S.S. Rotterdam. The bus will continue as boat, in a rather special way! After the round trip the bus will bring you back to the pick-up point in the Parkhaven (Euromast). Last week it became known TripAdvisor® has awarded Splashtours an Certificate of Excellence. For the 7th time this certificate is awarded to companies that received excellent reviews from travellers on the website of TripAdvisor . Winners of this Certificate of Excellence are restaurants, accommodations and attractions from all over the world that offer a consistently good customer experience. For our opening hours, click here! Book your trip with Splashtours here online with a discount! We recommend to make an online reservation for your laser battle. You will receive a confirmation by e-mail mentioning the exact hours of your lasergame sessions. Make a reservation in advance in order to avoid disappointments. The location of Lasergame Rotterdam is at the Parkhaven, opposite the Euromast (Navigational address: Parkhaven 9). At the schip ‘De Zwarte Zwaan’ you’ll find our lasertag arena and the escape room of Escaping Rotterdam. Payment at our location is only possible with a debit card or a credit card.